About 1,000 left-wing protesters yelled slogans like "Nazis out" and "There's no right to Nazi propaganda," at a group of right-wing demonstrators about double in number. They retorted with "We are louder, we are more" and "Lying press." The city's police department reported on Twitter that several people were treated for injuries, but gave no details. Germany's Central Council of Jews condemned the violence, calling it a "civic duty to stand against the right-mob." "It must never again be accepted in Germany that people are attacked because of their statements or their background," council President Josef Schuster said in a statement. "We will not abandon the streets to violent offenders and those spreading chaos," Saxony state Interior Minister Roland Woeller said. Earlier in the day, Chancellor Angela Merkel's spokesman, Steffen Seibert, strongly condemned Sunday's violence. "What was seen yesterday in parts of Chemnitz and what was recorded on video has no place in our country," Seibert told reporters in Berlin. 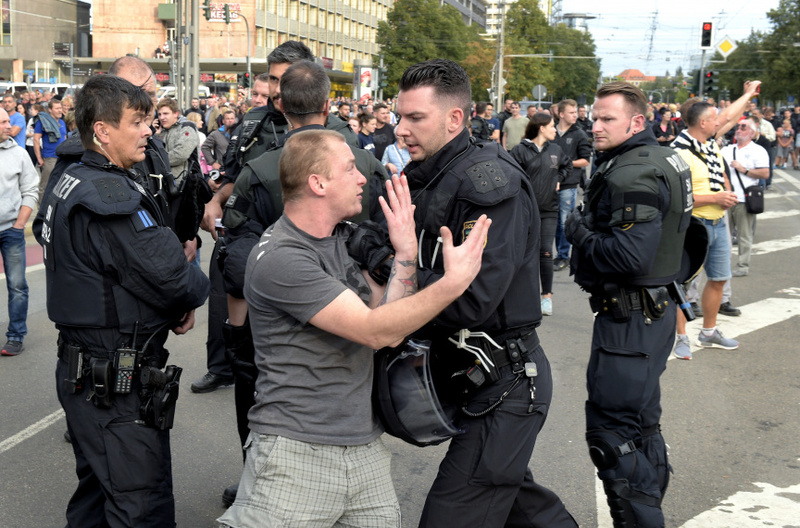 "There is no place in Germany for vigilantism, for groups that want to spread hatred on the streets, for intolerance and racism," Seibert said.